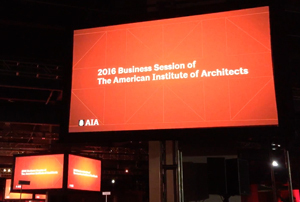 At the Annual Business Meeting of the American Institute of Architects (AIA) held in Philadelphia on May 21, 2016, representatives of the AIA’s local chapters, state organizations, and national governing bodies voted on whether the AIA should officially support a new WTC 7 investigation. 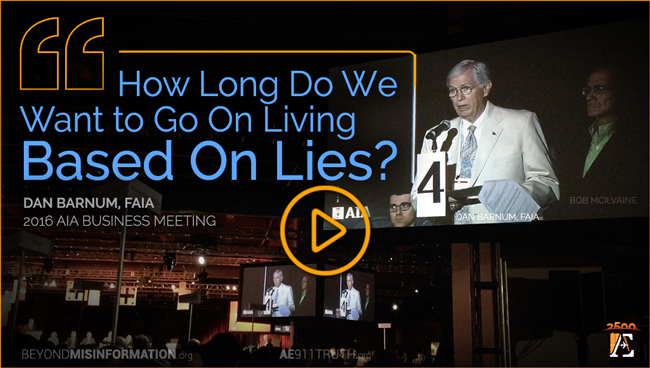 Resolution 16-3, which was sponsored by 97 AIA members affiliated with AE911Truth, garnered 11% of the delegates’ votes, losing 529 to 4,176. The 11% tally represents nearly a threefold increase over the 4% won last year. 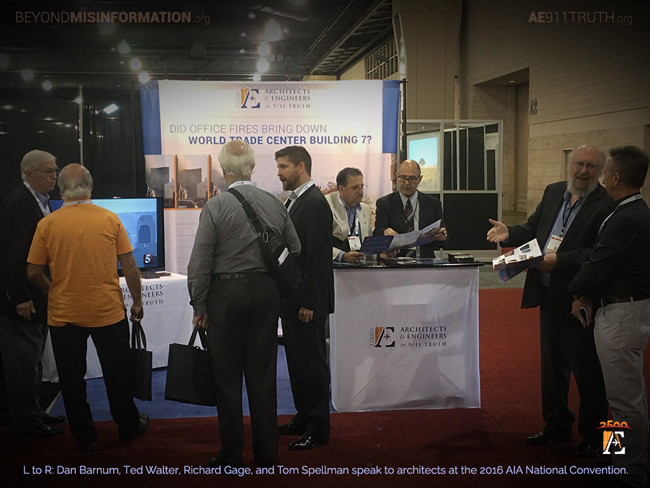 Dan Barnum, a fellow of the AIA and an AE911Truth board member, introduced the resolution with Bob McIlvaine, a 9/11 family member and Philadelphia native, standing by his side. Two opponents of the resolution and Richard Gage then spoke. After that point, another opponent called the question and the room voted in favor — leaving three supporters, who had been standing at their microphones from the beginning, without a chance to speak. Dan Barnum ended with a powerful closing speech (watch it here) before the vote took place. For those of us who were present both last year and this year, the tone of the debate was strikingly different. We felt a much higher degree of receptiveness, as well as a reluctance by opponents of the resolution to enthusiastically champion the official account. Only one opponent — the first to take the floor — echoed the board’s meek endorsement of the official reports. The second person to speak in opposition delivered nothing but vitriol, and the third opponent called the question. Meanwhile, throughout the three-day convention, we witnessed a continuous outpouring of support at our booth. Many delegates stopped by to register their intention to vote “yes” and to sign the petition or to ask questions if they were undecided. The growing of acceptance of our position and the weakening confidence in the official explanation appears to be driven by a number of factors. Perhaps most important was the decision to include the WTC 7 evidence in this year’s resolution. Also, our intensive mail and email campaigns over the past 12 months seem to be paying dividends. In addition to tripling support for the resolution, we gained 148 petition signers, distributed more than 1,000 brochures and DVDs, and made numerous contacts with architects wanting to assist our efforts. 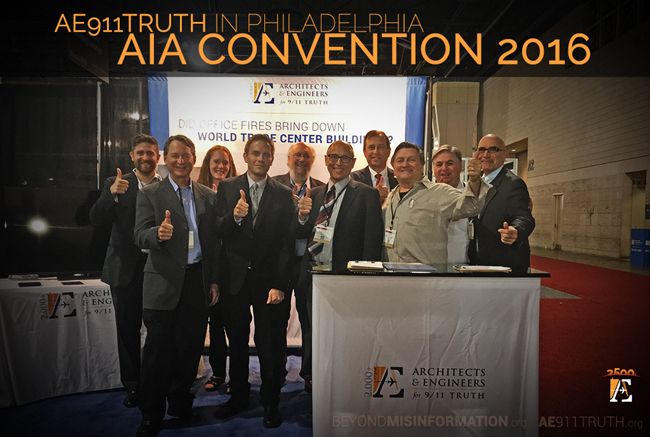 The unprecedented progress we made at this year’s AIA Convention is because of the incredible determination and generosity of many thousands who have stood with AE911Truth and the 9/11 Truth Movement throughout the years. We thank you for bringing this vital cause one step closer to success.